Part of the appeal of coming on holiday to Byron Bay is not only can you do some amazing surfing, watch for migrating whales and a whole host of ocean- and beach-based activities, you also can enjoy the hinterland where you can hike, admire gorgeous waterfalls and look for rare animals. We’ve gathered a list of five national parks near Byron Bay (or at least in a relative close drive from) that we feel are worth a visit on one of your next Byron Bay holidays. Check them out, and start deciding which one(s) you want to add to your itinerary. About an hour’s drive from Broken Head Holiday Park, the 1,100m high Mt. Warning is considered one of the favourite activities to do on a Byron Bay holiday. Many hikers suggest heading out early in the morning – pre-sunrise, so bring lights – to be among the first to see the sunshine in Australia atop the summit. It will take you about two hours to get to the top (maybe more in the dark) and the last 250 metres is done by chain assist, but we promise the amazing 360 degree views are well worth sacrificing some sleep. This hiking destination is also worth coming to at any time during the day. You’ll still enjoy magnificent views of the area that stretch from the Gold Coast to Byron Bay. Located near Lismore, which is about a 45-minute drive from Byron Bay, Nightcap National Park, a World Heritage park, offers up some of the best hikes in the area, stunning views and great places to take a picnic. Minyon Falls provides a chance for holiday visitors to take in the Byron Bay hinterland. Marvel at the beautiful falls and, if it’s a clear day, the view all the way out to the coast at the lookout before you head down the trail. The hike, considered hard due to the steep incline, is a 7.5 km round trip. Getting to the bottom is well worth the effort when you feel the cool water and enjoy the view back up the approximately 100 metres tall falls. (Note: No swimming here because it is home to the endangered Fleay’s barred frog.) Bring a picnic and refuel before making the hike back up to the top. Considered a must-do of Australian hiking trails, a visit to Protesters Falls is not to be missed. The falls, one of the tallest in Australia, are the highlight of an easy 1.2km walk travelling from Terania Creek picnic area through beautiful bungalow palm forest to the base of the falls. Swimming is not permitted in the area because the endangered Fleay’s barred frog calls it home. Check out this video about the falls of Nightcap National Park. Conveniently located in Byron Bay, this national park contains a great beach where you can not only go swimming but also watch for birds and whales, go fishing and enjoy a picnic. One of the main attractions of this park is Tallow Beach. One of the most photographed beaches in Australia, Tallow Beach is a long, open beach, perfect for taking a nice beach walk where you’ll enjoy stunning views of the Byron Bay area. If you are looking to whale-watch during the right season, you should have a great opportunity here to catch views of migrating whales. Or perhaps if you like birds, then here you can find osprey, white-bellied sea eagles and pied oystercatchers and even more in and around the paper bark trees behind the dunes. While there aren’t any main walking trails, this is a great place to have a picnic, especially for families with nearby Gaggin Park, about halfway along Alcorn Street. The beachfront park not only provides a good access point for Tallow Beach, but it also has a great set up for families – picnic tables, BBQs and a playground (that even has shade!). 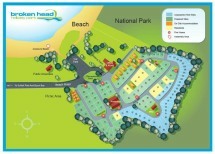 Situated super close to your holiday accommodation in Byron Bay at Broken Head Holiday Park, the Broken Head Nature Reserve is an excellent spot to spend a whole day! It features all the aspects of a beach holiday you desire: swimming, sunbathing and a BBQ for a picnic as well as a walking trail that takes you through the rainforest sitting right next to the beach. The walking trail, called Three Sisters, is 1.2km one way and takes about 90 minutes to complete, round trip. The view from the lookout provides the perfect place for admiring the natural surroundings from the pristine ocean to the secluded beach. This location is a great place to watch for whales during migration season (May-November). You also may observe white-bellied sea eagles diving into the water for their food. The Broken Head Reserve is a great spot for a picnic, and if you’re looking for other good picnic location ideas, check out our list of the best places for picnics in Byron Bay. Although this is the last park mentioned on this list, it is by far the most diverse and interesting. The park encompasses 22,000 hectares of coastline and is home to countless species of birds, wildlife and sea creatures. Unlike most National Parks, the Cape Byron Marine Park incorporates recreational and even commercial activities for visitors. This means that you can catch fish, scuba or snorkel, go out in a boat or indulge in a number of other interesting things to do. However, you must be aware that there are some areas that have been zoned specifically as sanctuaries where you will not be able to take part in most of these activities. Be sure to check out our information about fishing in the park. One of the highlights of this park is Julian Rocks. Just five minutes from the shore of Cape Byron Bay, Julian Rocks provides a home for more than 400 types of tropical fish, three species of sea turtles, rays and many more marine animals. The reserve is rated one of the best places in all of Australia to snorkel and dive so don’t miss your chance to visit Julian Rocks while you’re in Byron Bay. If you are interested in visiting these parks and going on the hikes, then you sound like you would be the perfect fit for Broken Head Holiday Park. We’ve got a variety of accommodation options for you from non-powered camping sites to beach shacks. You’re sure to find something to fit your needs and budget. So don’t delay! Book your stay and start planning which of these excellent Byron Bay national parks you’ll visit first.